Ever since I heard word it, I’ve been anxious to try Helmut Newcake, what’s been heralded as the first gluten-free bakery in Paris. 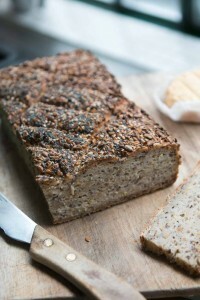 While a couple of bakeries and natural food shops offer gluten-free bread, they’re invariably made somewhere where other breads are made (risking cross-contamination with wheat flour), or the salesclerks simply stack the gluten-free breads with the regular ones, which is little comfort to those who can’t tolerate eating gluten. So it was a nice surprise to visit Helmut Newcake, where pastry chef Marie Tagliaferro whips up classic French pastries using a variety of flours, including chestnut and buckwheat, to create a range of desserts that are so close to the originals that they told me that a majority of the customers who come in have no idea they’re even in a gluten-free bakery. Tartlets are made with ground pistachios and fresh red currants, lemon filling nests in buttery pastry then gets meringuée, and Madame de Fontenay Chocolat has a crown of caramel over a puff of crisp choux pastry and a smear of chocolate ganache. And the French are wild about Le Cheesecake, and my friend Zeva, who I was splitting everything with, said was one of the best she’s ever had. It was great, with the fresh flavor of good cream cheese, not overly heavy and dense. It was a bit crumbly and I dropped more than a few bits on the beautifully finished wood floors while trying to shovel it into my mouth while perched on a high barstool. So like a good guest and seasoned pastry-lover, before I left, I took care to leave not a crumb behind, anywhere. In addition to various cakes and cookies, they’re making bread on Sundays, to go along with le brunch, as they say in Paris, but any day of the week, this is one of the few bakeries in town where you can sit down and have a bite to eat with coffee, New York or London-style. Marie was obviously influenced by the coffee-shop vibe. And happily, the coffee is very good, too. There’s a rayon of gluten-free products from neighboring European countries, such as cereals and a few baking ingredients for those wanting to do a bit of browsing shopping. I’m not gluten-free but am thrilled that there’s finally a place where people who are, can come and enjoy French pastries without a care. Because who wants to worry when they’re eating dessert? 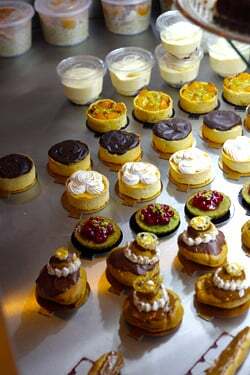 Those tartlets look pretty amazing, the french really do know their pastries. Great to see that you can still create exquisite-looking and great-tasting desserts which are gluten-free. 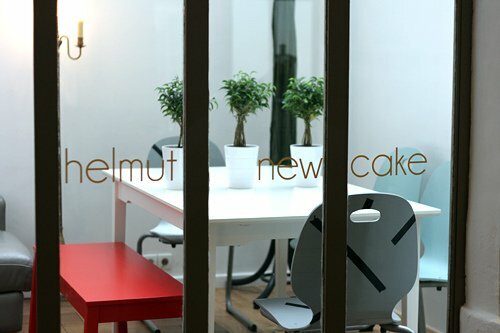 I have some friends who will be very interested in visiting Helmut Newcake in Paris! 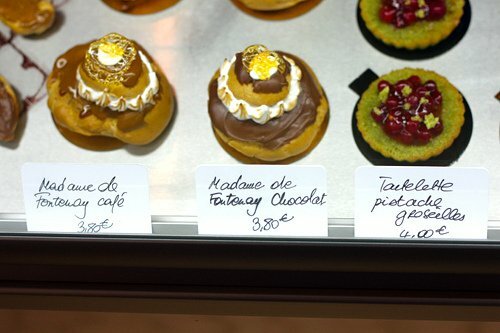 This is fantastic news that a dedicated gluten free bakery has opened in Paris. It’s also wonderful to hear these gluten free pastries are as good (and in some cases perhaps better) than their gluten-containing equivalents. I can’t wait to visit! Looks good! think I shall pay it a visit next week! Such good news! This is one of the first dessert posts I’ve read in a long time that didn’t leave me a little sad on the inside. It is nice to see that options are available. It goes without saying that some of us are curious how old school Parisian pastry chefs feel about making gluten free products. These pastries are gorgeous, by the way. Oh David…. you have made my day! London has just got its first GF bakery too. Must add this one to this list to visit when next over. And I love it that you of all people think they are good. Thanks for sharing! Sounds wonderful. Saving this for my next trip to Paris! I spotted my favorite British tea :) Eager to try the place. I was just there yesterday evening, for my second time! 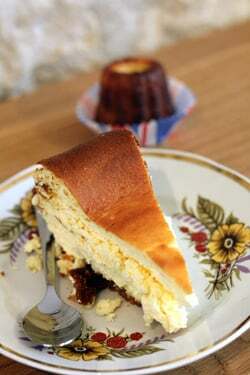 When Helmut Newcake appeared in the paper “A Nous Paris” a few weeks ago, I knew I had to go, so my friend, blogger Jennifer from the blog The Accidental Parisienne and another friend of hers and I tried them out a couple of weeks back. Good, good stuff, and a very welcoming atmosphere, too. Just so folks know, none of the pastries are dairy-free. About 50% of people who are gluten intolerant are also dairy intolerant, so this could be important for people who are gluten intolerant or have Celiac Disease. 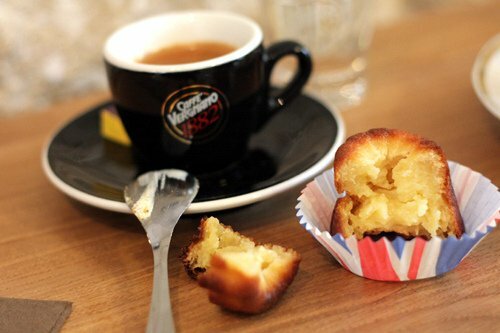 But, there are several pastries made with butter alone — no cream or milk are in them — such as the madeleines and the cannelés. I’m one of those who can eat butter from time to time, so I am glad for these options. So far, I’ve tried the chocolate fondant and also the pistachio and current tartlet — both were terrific! I can’t recommend this place enough! I’m so glad that you hopped on this one, David, and went to try their stuff out. I hope the trend continues and that awareness increases about gluten and its effects on the body, especially for those walking around with undiagnosed Celiac Disease, here in France. I’m super thankful for the work Marie and François are doing. Ii did later read that he was Marie’s husband, but I didn’t ask them, so didn’t print it initially. It is pretty interesting that they opened here in France, because as he said, France has been a little slow to adopt gluten-free items. But the good news is that means the field is wide-open, so there’s room for more! wow everything looks great! Will definitely remember this place next time I am in Paris!! 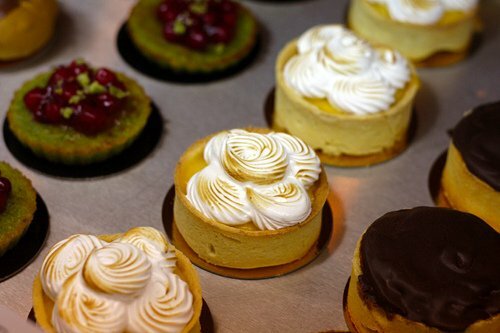 Can’t wait to try the citron tarte and the canele and and..
What terrific news ! Not that gluten-free has arrived in Paris, as that concerns me very little (but is interesting, etc). Rather, that my lifelong pipe dream of opening a bakery that opens at 2 pm – so that I could sleep in a bit and not have bags under my eyes – could actually succeed somewhere, maybe. Now to move to France and actually learn the skills needed to open a bakery, run a bakery, bake the goods for the bakery, and so on. I love your attitude towards us who are gluten-free. So many people are not receptive to the idea, but your last comment about enjoying dessert says it all. 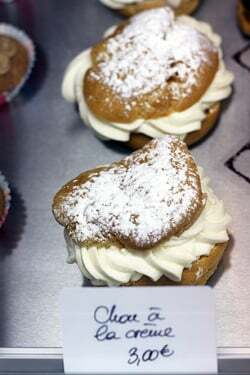 Thanks for featuring this cafe in your blog post and supporting the gluten-free community! I don’t quite understand when people aren’t ‘receptive’ to various diets, because people have their own individual needs and diets. It’s true that when I worked in the restaurant business there were guests who had questionable dietary needs (one woman told me she could only eat “white food”, and another person told me they were allergic to “cooked fruit”) and perhaps they are actual allergies…um, but those kinds of things make people skeptical of others who have actual allergies/intolerances. Plus I think nowadays, there’s so many interesting flours (buckwheat, corn, etc) and things like coconut milk, that can be swapped out for other ingredients, which add a whole new palette of flavors, rather than just being 2nd rate substitutes – am happy to report her canelés and cheesecake (crust) are just as good, if not better, than the originals. How lucky to live in Paris and have all these fantastic places to go to. Its good to see places like this opening, so everyone can enjoy foods like this. This is fantastic news. Compared to Italy, France seemed a bit tougher when I was there, when it came to finding wheat/gluten free foods. That’s why I had pure buckwheat galettes for many of my meals. It’s a hard life! Is their name a play on Helmut Newton? If so, major points for that! This post makes me want to cry! I was in Paris just a couple of weeks ago, and I scoured the webs for information about gluten-free offerings there. I didn’t find much, apart from your post about eating gluten-free in Paris from a few years ago, so I was thrilled to stumble upon 100% buckwheat galettes near the Pompidou. Gosh, I wish I had found this place! Looks like I’ll have to make another trip soon. I don’t really like to direct people toward natural food stores in Paris who are gluten-free, because the selection is mostly pre-packaged items. And while I haven’t tried them, I don’t think many visitors to Paris want to eat gluten-free madeleines from a bag. 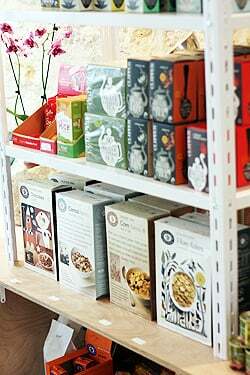 However some natural food stores, like Biocoop, have fresh gluten-free baked goods on the bakery shelves, although for those very sensitive to gluten, they’re stored on the same shelves as the regular baked goods. So it’s great to be able to report a full-on gluten-free bakery in Paris! 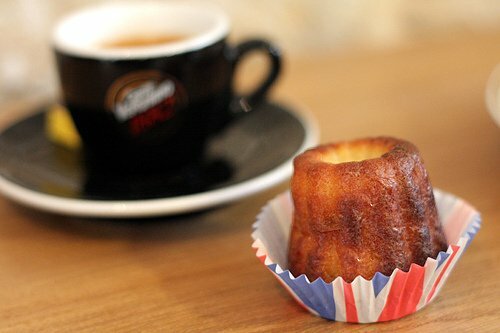 caneles. 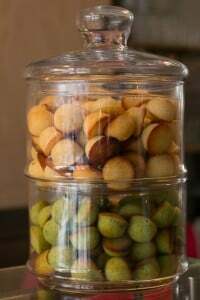 One of my favorite French desserts of all time. Was there any rum in this one? I must say that I’m quite lucky here in Finland as almost any restaurant or shop will have at least some gluten-free bread/soup and many will have some kind of sweet stuff, so I never have to settle for “just a salad” which pretty much all that I know is safe in many countries. I’m glad that France is catching up, now if only my other base in Marseille also had a GF bakery! France isn’t necessarily a “service” country, so when you eat out, you’re a “guest” (as you would be, at a dinner party) rather than “the king”, as customers are in America. And as you, and the Frenchman at the bakery counter mentioned, things like gluten-free aren’t quite well-known here. But I think as French people travel more, especially the younger generation – like the folks who own Helmut Newcake (they were inspired by living in London for a few years) – people in France are starting to be more aware of food allergies and intolerances. For example, there are lactose-free milks and butters in some supermarkets and you can find gluten-free items on the shelves, although they tend to be more pre-packaged items. OMG, I think I may have to kiss you. I just recently discovered my “sensitivity” to gluten. Just as I was becoming a “foodie” and learning to cook. I don’t know to what extent I’m sensitive to it. I do know for now I keep it out of my diet, which i have to say, has made it VERY diffficult to read your blog. The other night, I broke down and used gluten free OAT flour in a white wine butter sauce. I found a source for it that costs a ziilion dollars to ship it here. it’s easy to find “gluten free” baked goods but hard to find “gluten free” Oats or Oat flour etc. because most people don’t “get” the cross contamination thing. I also happen to be sensitive to corn and corn flour. sigh. makes it harder. it’s not as bad as wheat and now and then, i’ll break down and eat the gluten free bread made with corn flour. I bought a bread machine right away to bake my own bread but w/o corn flour, that becomes even a little harder because finding ingredients here in Switzerland is pretty hard. You know what the sad part is? i never learned to bake with “normal” ingredients before this. Now I have to figure out how to “substitute” before I figured out what things like white flour, yeast, and other flours would “do” to baked goods. We’re visiting Paris in April. It sounds so cliché to me to say that. Like what other time is there to visit Paris? We’ve become the Euro-cliché. But I’m really thrilled to see this bakery. Can’t wait to try it! PS. the more i read about what happened to wheat over the last 50 years, the sadder I get. We did this to ourselves. I wonder if we never touched it, and just let it be, if we’d have this sudden sensitivity to it. I was just reading in Carol Field’s book The Italian Baker, how much bakers in Italy rave over American flour because it’s stronger. (She says that “the Italian earth, which remains hospitable to grapes and olives, has been so consistently exploited that it day it produces weak grains that lack the strength and flavor of grains of the past.”) French flour is very finely milled, and not strong, and I wonder if it’s also because the soil has been overworked and instilled with too many pesticides. Looking forward to trying this place out. Love the name – pure genius! Very good news! Wish this shop was open when I was living in Paris…. Btw 09 for a Paris landline? Shouldn’t be 01? Or 06 for a mobile phone? Thank you so much for posting this! I’ve known for a long time that if I were terminal, I’d spend my days in France eating pastries and unpasteurized cheese. When I started dating someone gluten intolerant, I had a sharp little pang when I realized I wouldn’t be able to share the best of the European culinary experience with him. Always a pleasure reading your blog! I always wondered what a gluten allergic French person would do to eat those desserts or if there is any gluten sensitive people in France at all :) I am not gluten free but I know lots of people who would enjoy to see this. Excellent! A new place to try when I get back to Paris! Never before did I want to go to Paris. And then I found this blog. ok the gluten-free fad has reached Europe with ridiculous proportions (supermarket here selling candies write “sans-gluten” on the packets just as Americans for a while, or maybe still would write 99% fat-free on the same candies). yes, well, why don’t we have egg-free or nut-free bakeries because people get asthma from eggs or eating nuts. surely, it’s enough to offer gluten-free food along with regular ones? do we really need special shops for this? Man, my patisserie list just gets longer and longer. Nice to have something open later than most patisseries — you can have a late snack with more than end-of-day leftovers to choose from. I don’t see macaron pictures — that would be a no-brainer for a gluten-free place. Do they make them? David, this news is fabulous! Thank you so much for sharing, and in your usual charming manner, too. I quickly was visualizing myself there enjoying all those treats safely. :-) Now I have even more of a reason to visit a friend who recently moved to France! Thank you so much for sharing this wonderful news. Will definitely make a visit when I’m in Paris next. And I will put this link in the newsletter I write for the gluten free community in Marin County, California. Lots of travelers to France in our group. You know those ads that say loose your belly fat in 7 easy steps? Well — I just bought this book by Dr. William Davis called “Wheat Belly — Lose the wheat, lose the weight, and find your path back to health.” I was determined to lose my belly fat and look like I did in college, and why not? If anything, I’m shorter now as a 67-year old. I am here to tell you that it works. It has been about 3 weeks, I cut out all wheat, and I have lost 4 lbs of belly fat. (My theory is last on (belly fat), first off — LOFO.) In addition, I guit drinking my 2 glasses of wine a night. According to an article in Bazaar that I read, “…alcohol both slows metabolism and is readily stored as fat.” Not to mention the calories. And of course I exercise. So I am thrilled to see this oddly named patisserie, Helmut Newcake in Paris. Win-win! Beautiful but when I have tried to bake with these flours I find a heavy or fatty taste is that just me or is there a different way to incorporate this flours when baking? When I had my table d’hôtes, I had a few bookings with gluten-free guests. I bought a book “gluten free diet for dummies” , learned a lot from it and from my guests ( before they arrived, we had many exchanges to make sure everything was alright). I know that for the really sensitive ones, none of their food should stand next to gluten one. Having such a place available is great. Thank you for sharing and I will go as I love cannelés and all the rest. Thank you, thank you! My French husband is celiac and finds eating GF in France when we go back for vacation so difficult. We will be going to this bakery next time we are in Paris for sure!!! OK honestly, I’ve wondered for years, silently, curious, incredulous sometimes, filled with jealousy others but now, I can’t keep it in any longer…here it is: how on the world do you stay so *thin*?!! How is it humanly possible when divine cream and sugar surrounds you?! OK, I’m done. This comment comes from a 70 year old living in Eugene, Oregon. I have been reading your blog for several months now and want to say “Thank You” for sharing your writings about Paris. Looks like I may get to visit Paris next year and look forward to such a long anticipated visit. Also just finished your book “The Sweet Life in Paris” So well written and so enjoyable to read !! Oh my gosh I wish I had known about that place when I was in Paris from New Zealand just before Xmas. It looks like they have really captured the spirit of a gorgeous Frenchl bakery while staying true to their aim. I m not gluten sensitive but if I eat (UK) supermarket bread my stomach bloats almost immediately. My home baked bread (just wheat flour, yeast, salt, water) doesn t have this effect – neither do supermarket pitta/flat breads. I think its the additives and processing that they use that are the culprits. I am not surprised to hear they were able to successfully create fabulous treats. Breads. That’s harder, so, bravo! I would have been sucked into that bakery from the looks alone (yes, I’m shallow) I’ve been experimenting with gluten-free baking as of late and I must say, it’s been a challenge. Fun to experiment though. This is wonderful; about 6 months ago, I was diagnosed as gluten intolerant. I LOVE to bake and have thought of owning a tea/bakeshop myself at times….then this. Finding ingredients and recipes that are truly delicious is an arduous task. But, finding places to actually enjoy gluten free delights is almost impossible…. If I travel to Paris, this lovely discovery will be on my list of must visits….but I truly felt as if I almost went there while reading your wonderful review….you do a marvelous job of telling every detail…. That’s interesting what you said about The Italian Baker. However, I was not referring to overworked soil or pesticides so much as genetically modification. I read recently (sorry don’t remember the source, I can try to find it if you’re interested) how over the last 50 years, wheat in general has been genetically modified for many nobel reasons (solving world hunger) and not so nobel reasons (fluffier products). The modifications involved “more gluten.” When I read about gluten as a protein composite that served as a natural pesticide for the plant, and then it was increased through genetic modification to make products fluffier. What I meant was: I wonder if we just left it alone if this would have happened to our population increase in gluten intolerance. Further, I say this movie on TED recently: http://youtu.be/rixyrCNVVGA about corn GMO. And it struck me as odd: creating a corn seed that has it’s “own pesticide built in.” Were they modeling wheat’s natural (pre modified) protein pesticide protection in hopes of producing more corn? and in fact I seriously wondered if that was why i was also sensitive to corn as well. Because it seems to me it’s the same thing; producing a protein through genetics as an automatic pesticide for the plant. I’m not a biologist. I’m not a doctor. I’m just observing, learning and wondering. I’m sure any doctor would balk at my theory. However, like you, 8 years ago, i had NO idea what the heck gluten was. I knew it was in pasta. Then I had a guest who came to dinner and I was making my lovely puttenesca sauce and he tells me he can’t have gluten. I’m like “i wash it off the pasta after it’s cooked.” ha-ha. right? then I’m like “ok, well we have this really great freshly made Italian Pizza.” i know, right? dingbell was my name. So i go on with my life and the last few years my health suddenly got weird in that no doctor could figure it out. they tried to give me anti-depressants. A health-nut most of my life, like you, i believe if you stay fit, exercise or walk lots of places, you can enjoy ANYTHING in moderation. I couldn’t figure out why i had such low energy and why my body felt like it had inflammation all over it all the time, or why brain felt like I was smoking a permanent dobbie. It was completely by accident that I made the connection to gluten and went back to the doctors and said “test this.” because like you, i really refused to believe a varied and healthy diet could do this to someone. And like you, i’m always questioning those who claim the really weird food allergies. I was always lactose intolerant but that didn’t keep me from dipping into gelato in Italy or the cheeses in france. Which back, in the early 90’s when i traveled, i have to say, the European cheese did NOTHING to me that American cheese/dairy did. Today, it’s not true. I don’t know if it’s from changes in the cheese, the cows, the processing, or that i’m just getting older… anyway, lactose intolerance doesn’t keep me from indulging now and then. Like I said, I don’t know my own intolerance level. I do know when I travel, i’m certain I eat it from contamination at restaurants. Because flour gets everywhere, or they put it in things you wouldn’t imagine. And my body reflects that i”ve had it. I’ve seen gluten in ICE CREAM and frozen yogurt. But I’ve also known people who have the sensitivity and have done a huge purge, given their bodies a cleanse over 8 months or year and can now occassionally have it without too much trouble. I know a bunch of gluten sensitive and celiac disease people will balk at that. but I’ve heard it from first hand experiences. So far I know that if i have it occassionally, it affects my digestion pretty fast, but all the other symptoms don’t appear unless I’m eating it day after day. So it makes travel a little uncomfortable, but not debilitating. And I have to say, I’m going to Venice at the end of February. The Italians may be on the ball with Gluten free products, but I don’t think I’m going to resist the pizza or pasta. We’ll see if I come back swearing never to indulge again! I am going to make the tart one day normally as planned and then try varied substitutions. I’m not bold enough to just go off and substitute without trying it from the original recipe! OH this is fabulous news! But, they stole my idea! Did you hear the program on France Inter about Celiac disease in France? They estimate 1% of the population has it, just as the US. My Celiac is extremely sensitive and I have had fabulous luck at many restaurants when I explain and apologize and say thank you! I think I’m going to convince my husband we need to brave the (-) temps today and head to the 10th! My gluten-intol friends who live in Paris will be thrilled! Though, as a gluten-into person myself, one way I’ve been able to stay slim (at my age!) is by avoiding most grains and all breads and cakes…with the way the gluten-free baking is going…creating more and more wonderful, great tasting and looking stuff…I won’t be able to resist! Oh well…just have to go to the gym more! THANK YOU for this article. You just completely changed the complexion of the next trip to Paris. Merci, merci, merci. Do they they make croissants? 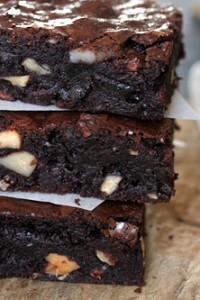 One of my top-missed baked goodies…. They don’t, because I think that’s quite a challenge and they don’t seem set up for morning pastries. But I didn’t make it to Sunday brunch yet, so perhaps they are doing something of the sort. Thank you for this article. As I come to terms with my son’s serious food allergies (not wheat, but also not a fad, alas) and try to wrap my mind around traveling with these challenges, this sort of step gives me a boost. I wonder if you can tell me if French bakeries tend to use dairy or egg when making, say, baguettes. David, I have been experimenting with canelles recently. Do you know what they use instead of regular flour, butter and milk? 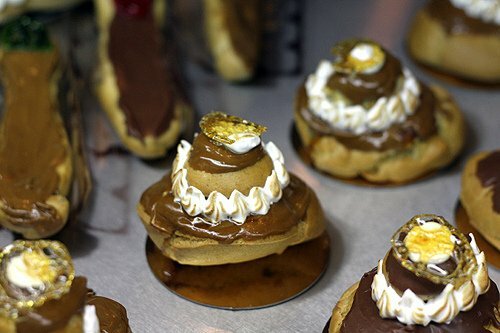 I would love to try these bu my chance of getting anywhere near Paris anytime soon is..oh zero. Love your blog by the way. I am not surprised to hear they were able to successfully create fabulous treats. Breads. Great news! DAVID! Now I can visit you! Plan on it soon. I am so happily going back to Paris, now. It was difficult last time, trying to eat GF, but this will make life so much more pleasant. Did they happen to have a croissant? Oh goody! I’ m going to visit Paris in June with Road Scholar. They promised me GF meals in the hotel and scheduled restaurants. But I will have to look this place up! Ah this is so good to know – thank you! I have been wondering how I would survive for three weeks of eating gluten and dairy on a trip to to Paris we are planning (because I could not go to France and not eat the cakes, pastries, cheese, etc!!). I was prepared to suffer for the sake of good food…but now I could have a day or two of “rest” in between and have gluten free versions. Have my cake and eat it too as it were! Yay! Oh I can’t wait to visit! I am so excited to find this information, thank you so much for sharing everyone. We are going to Paris in April and being recently suspected of being gluten intolerant I was deeply concerned as to how we would manage my diet. This is wonderful news!!! Gives us hope that we will find vegan options when in Paris this summer. Will definitely check this place out, thanks for sharing! My mom is gluten-free, and she and her boyfriend are visiting me in Paris this week, so I took them to Helmut Newcake (we all love your blog and The Sweet Life in Paris!). It did not disappoint. The pastries were unreal delicious, and we liked the lunch special they were offering as well. My father was a pastry Chef, so I grew up eating and loving pastries. Unfortunately, I had to go gluten free January 1 of this year. I live in Paris and it’s been a challenge. I’ve been exploring where it’d be easy for me to get gluten free products aside from “bio” stores. Believe it or not Chinatown as alot of pastries that are gluten free made with rice flour, sticky rice e.g, filled (chocolate, bean paste…) mochi balls, cassava cakes etc., etc. Granted they’re not the same as French pastries, but fills the void. Now I’m waiting for the day I see gluten free baguettes, then I’ll be in 7th heaven.